At long last, the 2018 regular season is here. Yankees fans have been waiting for this day since the loss in Game Seven of the ALCS last year. Last year was a lot of fun, but last year is last year. 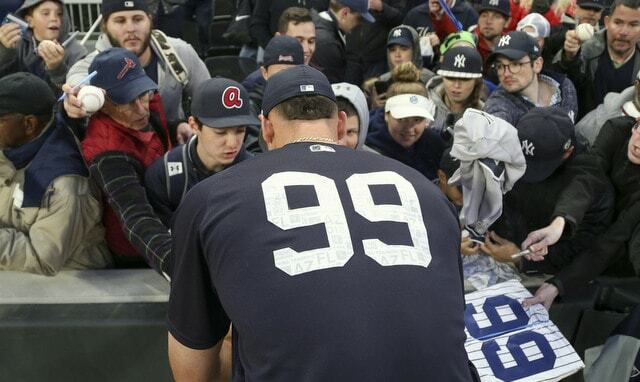 The Yankees won’t sneak up on anyone this year. They won’t be an underdog or a feel good story. They’re back to being the Evil Empire and I love it. It’s good for baseball when the Yankees are good and everyone hates them. Let’s get to some Opening Day thoughts. 1. It kinda sorta felt like Aaron Judge didn’t have a good Spring Training, yet he hit .289/.407/.578 with more extra-base hits (seven) than singles (six). Maybe his best performances came in non-televised games and skewed my perception. Whatever. Anyway, I think this speaks to expectations to some degree. We’re all expecting great things from Judge because he did great things last year, and if he’s not in the middle of a ridiculous home run binge, it might feel like he’s not contributing much, when in fact he is. Every time he goes six or seven games without a home run, people are going to notice and talk about it, and it’s going to feel like Judge isn’t contributing. And yet, chances are Judge will still be getting on base a ton and hitting the snot out of the baseball. Many players are truly one dimensional. When Chris Davis or Chris Carter or someone like that isn’t socking dingers, they’re kinda useless. Judge brings more to the plate, both offensively and defensively, though everyone is going to be waiting for the next homer, and when it doesn’t come for a few days, it might feel like he’s not helping much when in fact he is. It’s a weird dynamic. I kinda felt it in Spring Training. 2. Now that the season is about to start, it’s safe to say Giancarlo Stanton will play left field whenever Brett Gardner sits, not Judge. Stanton played 46 innings in left field during Grapefruit League play. Judge played zero. Judge did play five innings in left field during a minor league game, and he worked out in left field a bunch on the backfields, but not playing there at all during Spring Training games tells us he won’t play there during the season. Similar to those fake spring competitions the Yankees have been known to hold — Phil Hughes “winning” the fifth starter’s spot in 2010 is a notable example — it feels like Stanton playing left field while Judge stays in right was decided before Spring Training even started. I’m not saying this is a bad thing or even a good thing. It’s just a thing. Had this truly been a “let’s figure out who is best suited for left field” situation, Judge would’ve played the position more in actual spring games. Instead, all the playing time went to Stanton. The Yankees used all their information — and they have gobs of it — to determine Stanton is the better fit for left field at some point before this decision had to actually be made, and they proceeded accordingly. 3. I’m expecting a big season from Dellin Betances. I mean, I always expect a big season from Dellin because he’s so good, but I’m expecting an extra big bounceback season this year. Lots of people wanted him traded or whatever after last year’s control issues and I get it, believe me I do, but I was never all that interested in selling low on him. I liked what I saw from Dellin mechanically this spring — yes, that can disappear in a hurry, I know — and I think he’s pissed off and embarrassed about the way he finished last season. The stuff never wavered. Even when he struggled last year, Betances had his usual velocity and the breaking ball was still that F.U. breaking ball. It’s just mechanics and control for him. Dellin shed some weight over the winter and worked specifically on staying more in line with the plate, and I’m feeling pretty good about where he’s at right now and the season the come. Fifth straight All-Star Game, triple-digit strikeouts, and very little hard contact when hitters don’t swing-and-miss. That’s what I’m expecting. Seems like more than a few folks aren’t expecting much from Betances this year. I think he’s the bullpen sleeper. As weird as it sounds given his track record, he’s going to surprise some people and dominate (again). 4. A few days ago the Phillies signed top prospect Scott Kingery to a six-year contract worth $24M guaranteed. The deal includes three club options and can max out at $65M. This is notable because Kingery, a natural infielder who can also play the outfield, has yet to play in an MLB game. He hit .304/.359/.530 (143 wRC+) at Double-A and Triple-A last season, and he tore the cover off the ball during Spring Training (.411/.441/.786). By all accounts, he’s MLB ready, but the Phillies were going to send him down to game his service time before he agreed to the extension. The Phillies didn’t break the rules and I don’t blame Kingery one bit for taking the money. I’d do the same thing. I bring this up because eventually more teams are going to try to sign their top prospects long-term before they even make their MLB debut. That’s the next trend. Does the Kingery contract create a template for Gleyber Torres? 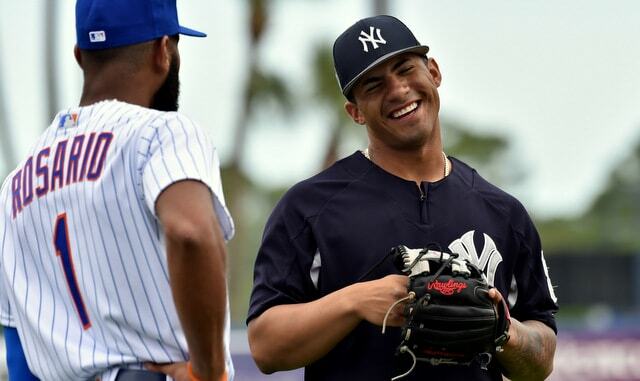 Gleyber’s injury throws a wrench into things, obviously, as does the fact he is roughly three years younger and the more highly ranked prospect by every scouting publication. Torres is a consensus top ten prospect. Kingery was ranked more in the upper-30s in the various top 100 lists, which is really good! But if you’re Gleyber and the Yankees offer you Kingery’s deal, don’t you ask for more because you’re younger and the better prospect? Maybe the Kingery deal is more appropriate for Miguel Andujar, though Andujar has already made his MLB debut. Signing any prospect to a Kingery-esque extension has luxury tax implications — six years and $24M is suddenly a $4M tax hit, even if he’s in the minors — so I don’t expect the Yankees to do something like this anytime soon, especially with Gleyber coming off the injury. Seems to me more Kingery contracts are on the horizon though. 5. I was working on something for CBS the other day when it hit me: James Shields is going to be mentioned as a potential trade deadline target this year. He’s 36 now and he’s been terrible the last two years (5.60 ERA and 5.94 FIP), but White Sox pitching coach Don Cooper has a way of reviving careers, plus Shields has the whole Proven AL East Veteran™ thing going for him. He’s also not going to cost much, both in terms of prospects or dollars. Shields will make $23M this season between his salary and option buyout, but the Padres are paying $11M of that $23M. Get him at midseason and the luxury tax hit would only be the pro-rated portion of the $12M owed to him by the Not Padres. So we’re talking about a $4M or so luxury tax hit if he comes over at the deadline. I’m not advocating for Shields! Maybe he does right the ship and is a worthwhile addition later this year, but right now, nah. He’s been too crummy the last two years. I’m just saying that, should the Yankees be in the market for a starting pitcher at the trade deadline, I would not be surprised if Shields’ name comes up. Don’t get mad at me. I’m just the messenger. 6. I guess I should make some predictions, huh? Our predictions went live at CBS yesterday but I regret most of them. I didn’t put much thought into them and rushed it one night. Like I said in the chat last week, I regret picking the Red Sox to win the AL East and want to take that one back. I think the Yankees will win the division. The Red Sox are pretty darn good and I think they’re getting overlooked to some degree, but to me, the difference is depth. Whenever injury strikes — and it will at some point, that’s baseball — the Yankees can turn to high-end youngsters to fill the gaps. The Red Sox are thin in the farm system and much of their depth is Quad-A types. The Yankees also have more quality trade chips and are in better position to improve at the trade deadline. Boston might have to deal someone from their MLB roster to get an impact piece at the deadline. The two MLB rosters are pretty even right now, but everything beyond that favors the Yankees. I take back my CBS prediction and am going with the Yankees to win the AL East. Also, while I’d love to see it happen, I don’t feel good about my Gary Sanchez for AL MVP pick. He’ll have to change the perception of his defense for that to happen, and, fair or not, that can be very difficult to do. I’ll be boring and go with Mike Trout to win AL MVP instead. So those are the CBS predictions I’d like to change. Yankees win the AL East and Not Gary Sanchez wins AL MVP. Gary’s still awesome though.